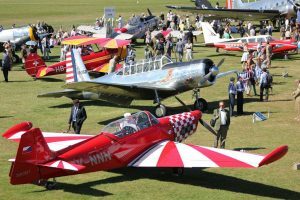 After 19 years of thrilling the crowds with spectacular air displays it seems the Goodwood Revival 2018’s aviation activities will be confined to the static displays and pre booked pleasure flights. The days of a Goodwood Revival air show are over, for this year at least. 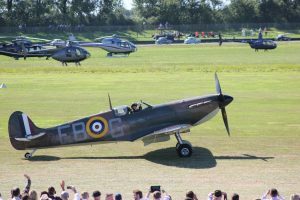 The 2018 Revival’s timetable contains no mention of any of the types of air displays we’ve seen in previous years, apart from short fly pasts by a solitary fighter in the early morning. Note: there’s a post written after the Revival here. 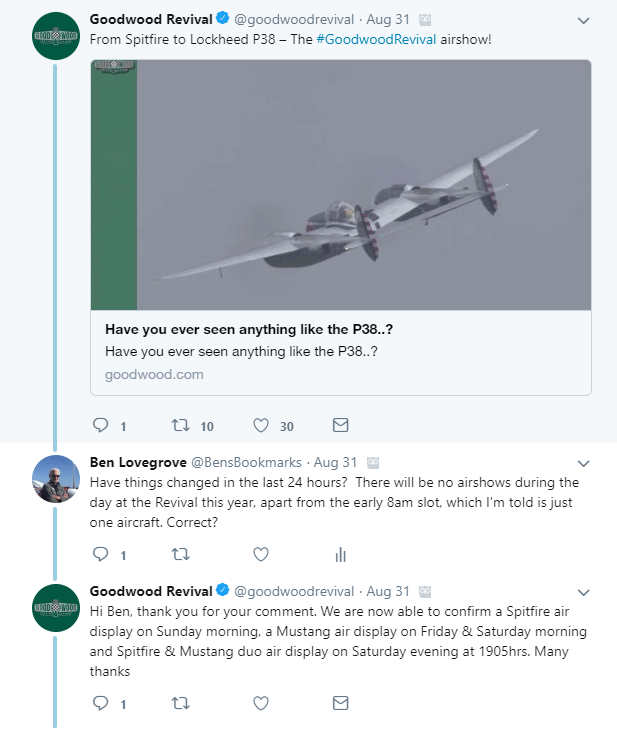 I sought clarification from the Revival team and was eventually informed (via Twitter) that the flying activity will be a Spitfire on the Sunday morning, a Mustang on the Friday and Saturday morning, and a Spitfire & Mustang air display on the Saturday at 19:05hrs. Someone also called me back from Customer Services to relay the message that the flying was minimal due to safety concerns but he was unable to provide any other details. He suggested I emailed and await a reply after the Revival. I have done so and will update this post if I hear any more. So, a Dawn Patrol each day and one evening slot by a pair of warbirds. Both time windows are outside of what you might call the core business hours of the event, and that may be significant from a red tape point of view. The Dawn Patrol used to be an aperitif, a mere foretaste of the several displays that we could look forward to throughout the day. Unless I’ve missed it there’s been no announcement about the cancellation of the air displays. Given how far in advance these types of events are planned and arranged one could imagine that the decision was taken months ago. So why was there no announcement for loyal Revival fans? The air displays have always been such a popular part of the Revival. I don’t know how popular and I would guess that the Revival team’s customer surveys would reveal more on that score. Taking into account that tickets go on sale ten months before the event it’s possible that many who bought their tickets will be as disappointed as I am that the Revival has become an almost exclusively a motor racing event. Of course, it’s always been mainly a motor racing event featuring races on four wheels and two, but the air displays have been an integral part of every Revival since 1998 when Ray Hanna flew a Spitfire along the start line straight. That type of flying has long gone everywhere. 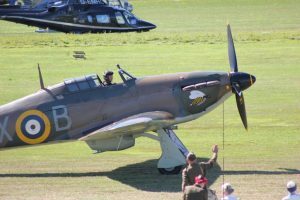 In these safety conscious days you won’t see any Spitfires flying so close to crowds that you can feel the breeze and smell the exhaust but in the past 19 years at the Revival we’ve been thrilled and inspired by the flying skills of a generation of expert display pilots. Over the last two decades the Revival air displays have included formation aerobatics by Spitfires, Hurricanes, Mustangs, Warhawks, a Blenheim, and in 2010 a Bearcat. Last year we watched a Corsair and a P-38 Lightning among others, delighting the crowds. There have also been fly pasts by the Battle of Britain Memorial Flight and displays by jets such as Hunters, a Canberra, and the now retired Vulcan bomber. It’s no secret that the rules and regulations for air shows were tightened up after the Shoreham tragedy of 2015. That was an awful sight and I’m not complacent about safety. What made it such a tragedy was that those who were killed or injured were not spectators of the air show itself. They were people passing by the airfield on the main road to the north. A thorough investigation by the CAA has resulted in changes to the regulations and that is only right and proper. Spectators who attend both air shows and motor racing events are used to seeing warning signs about the risks but they attend anyway. They trust that those risks have been mitigated as much as humanly possible by the event organisers. Risks are minimised but not removed altogether. The safest road racing is none at all, where cars remain parked in their paddocks. The safest air displays are none at all, where aircraft remain hangared and wheeled out for risk-free static displays. Are these the kind of events we want to see in the future? Let’s hope I’m proved wrong and that the Goodwood Revival 2019 will see a resumption of air displays, if for no other reason than to pay homage to the men who served at the airfield when it was RAF Westhampnett. It was their sacrifice that bought us the freedoms we enjoy today, whether sitting safely at home or watching motor racing and air shows. What’s your opinion? Add a comment below and air your views.